Gas analysis systems used for mud logging in the oil and gas industry provide information that is critical to optimize the drilling process and for ensuring safety on-site. As drilling speeds increase, measurement of hydrocarbons and nonhydrocarbons in real time becomes more challenging for traditional methods like gas chromatography (GC). 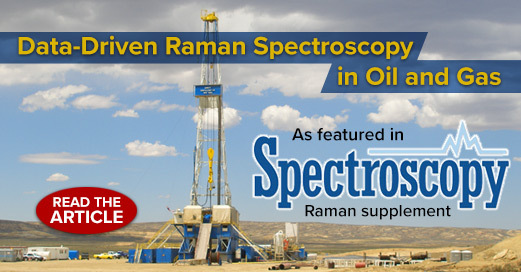 Raman spectroscopy offers a promising alternative for multicomponent analysis of complex gas mixtures, particularly when high-sensitivity compact Raman instrumentation is combined with advanced data analysis. Here we share a new data-driven Raman spectroscopy (DDRS) method capable of simultaneously measuring 12 hydrocarbon and nonhydrocarbon gases in the presence of matrix interferences. Validation of its performance using both standard gas mixtures and two real mud-logging data sets compared favorably against the GC method, demonstrating the feasibility of this technique for online, high-throughput quantitative analysis of gases in oil and gas exploration and recovery, as well as many other industries. Read the entire article at spectroscopyonline.com. Learn more about the WP 785 Raman spectrometer used for these measurements!